The clue’s in the name right? 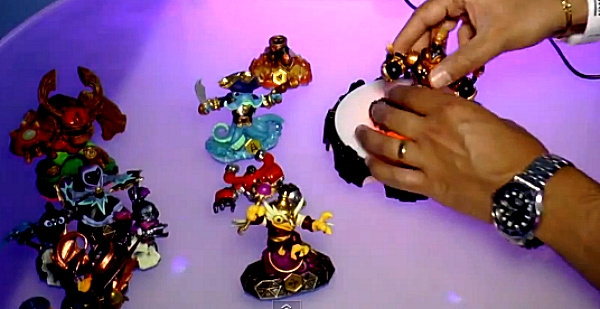 Skylanders Swap Force is an interesting proposition this year because of all that switching and swapping you can do with the new figures. What we hadn’t appreciated was quite how varied the new mixed up creations could be, or how much they would feel like fully fledged characters in their own right. Keen to get a taste what it will be like in the game, we took some time at E3 with Guha Bala, Studio Head at Vicarious Visions, to work through all the combinations of four Swap Force characters: Hoot Loop, Wash Buckler, Blast Zone and Magna Charge . As we worked our way through the swapping not only did it dawn on us that this was going to take a while — even with just four of the 16 Swap Force characters — but also that we were rubbish at figuring out what the new names would be. You see, each Swap Force character is named in two parts: Wash Buckler, Magna Zone, and so on. This means that when you mix them up, your new creation inherits its name from each half you have chosen. Mix up Wash Buckler and Magna Zone for instance and you can create Wash Zone or Magna Buckler. A favourite of mine is Hoot Buckler an Owl Octopus. Thankfully, for those with slightly limited imaginations like us, all you have to do is get the new Swap Force combo on the portal and the game tells you the name as part of the “magic moment” animation. Are you excited about getting to mix up your own Swap Force characters? Post a comment to tell us. Woohoo..more money down the drain for the kiddies. Dont get me wrong, the idea and concept behind it is quite fascinating, but the prices of these figures are just...urgh...it makes me sick how much they want to milk out of that stuff. Some of the earlier figures cost up to 20-30€ over here. Getting them all costs more than the console its played on...and people still argue about the "too high" prices of the consoles. Wasn't interested - have too many of these characters in my house as it is - but saw the last video and it got me interested. Though the last article only listed 8 new "swap" characters, now that I know there are 16, well that's a lot. And we already have 3 portals, don't want another. My kids birthday is in Jan. and if Disney Infinity crushes this then maybe we'll pick up Swap Force from the clearance rack. I buy at least half of my kids birthday presents from the after-Xmas clearance aisles in Target. Seems gimmicky to me... I doubt I'll bother with it. I'm interested, I'll give them that. But I'm not sure that I'll have the time or money to get this when a LOT of other titles will be arriving on Wii U. Getting kind of sick of skylanders. I already have the first two, so I DOUBT I'll get this. I am so pumped for SWAP Force! I've been playing through Adventure and have Giants on layby ready for when I get my Wii U, plus I've been tracking down the characters on my list (I'm limiting my collection to a fraction of the toys), so it's needless to say I'm looking forward to playing as Magna Zone...wait, isn't that a Pokémon? Why do people buy this crap? If you got kids, like me, at least wait for Disney Infinity. I'm a huge Skylanders nut, and even I can't justify that. Pretty much what @Nilbelit said. I'm someone who has stuck with both the first and second game, and been through buying all the figures. The first game, glitches aside, is very charming. The second is more refined, less charming. I had a tough time with completing my collection for the first game and gave Giants a chance purely because the whole "availability" thing was going to be resolved. I don't think it has been. The Giants at least looked like they fitted in with the original cast; I don't think the Swaplanders do. Possibly, I will either ask for this as a gift or get it when it's on the cheap and the figures on special offer, but my interest has waned.